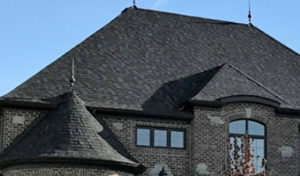 Roofing and Roofing Repair Geneva, IL - M. Pierce Roofing Inc. Roofing and Roofing Repair Geneva, IL - M. Pierce Roofing Inc.
M. Pierce Roofing is a specialized roofing and roofing repair company serving Geneva. Our skilled tradesmen provide exacting service and reputable products for both repairs and improvements to your home, office or multi-unit project. Our background in supply and installation further equips us to know which products will serve you best and how they should be implemented. We also repair interiors damaged by water infiltration in Geneva. We welcome the opportunity to learn more about the roofing or roofing repair you need. Contact us at (630) 538-1523 today – inquire about our referral gift-card program for Geneva customers as well! Contact us at (630) 538-1523 to further discuss our Geneva, IL roofing and roofing repair. If you choose, an M. Pierce representative can visit your property to assess the work you’re considering and provide you with a no-obligation estimate. Contact us at (630) 538-1523 to discuss our additional products and services for Geneva, IL. If harsh weather sweeps through Geneva, out-of-state ‘storm chasers’ may appear to offer you a free post-storm inspection. Their company duty is to have you contract with them to repair any storm damage. If you sign with one of these businesses, it will most often use local contractors for the repair work. After the repair is done, the business will focus on the next storm-affected location. Should you encounter a warranty issue, you might run into hurdles because the coordinating company has already moved on. M. Pierce Roofing is a local specialist in storm damage restoration for Geneva. Equally important to you, we stay local. If you face any post–repair work complications, we will be there for you to assist and follow up. Our storm damage restoration includes lightning, wind, hail, water damage and damage from trees. Contact us at (630) 538-1523 if you notice or believe that a recent storm has damaged your Geneva home or business. Working for his father’s roofing company while still in high school, company principal Mike Pierce performed every project from clean-up to roof installation. He later gained valuable experience in building-materials distribution through sales and ordering duties. He became educated in on-site project safety as well. His knowledge and leadership helped the company to grow into a team of close-knit experts that have been serving and working together for years. We exist to provide you with premium workmanship at a fair price for your next home, office or multi unit–property project. Call us at (630) 538-1523 to discuss your project in Geneva – we would welcome hearing from you!